Today’s recipe is all about ease. Quick and easy food. That tastes darn good. I love stir fries for all of those reasons. They’re quick, easy, and always delicious. 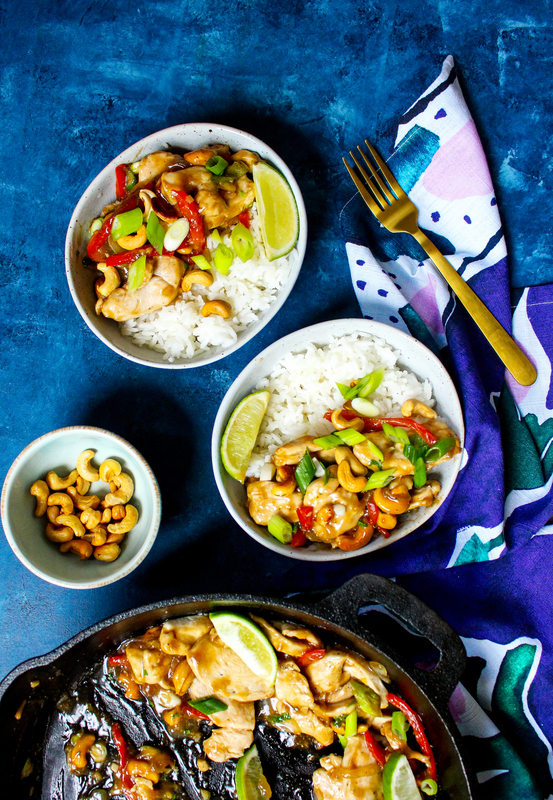 Once you build up your pantry with a few staples, like soy sauce, toasted sesame oil, and fish sauce, you can do any number of stir fry recipes without much shopping or hassle. They’re extremely versatile. And in our house, they’re always a crowd pleaser. They usually happen around here when two things occur: 1. I don’t know what to make for dinner, and 2. our fridge (the crisper drawers in particular) is beginning to overflow with ingredients that need to be used up. More often than not, I make a stir fry when I have a package of chicken breasts about to expire or a head of broccoli that is on its last legs. It is rarely a planned meal. But always a good one! 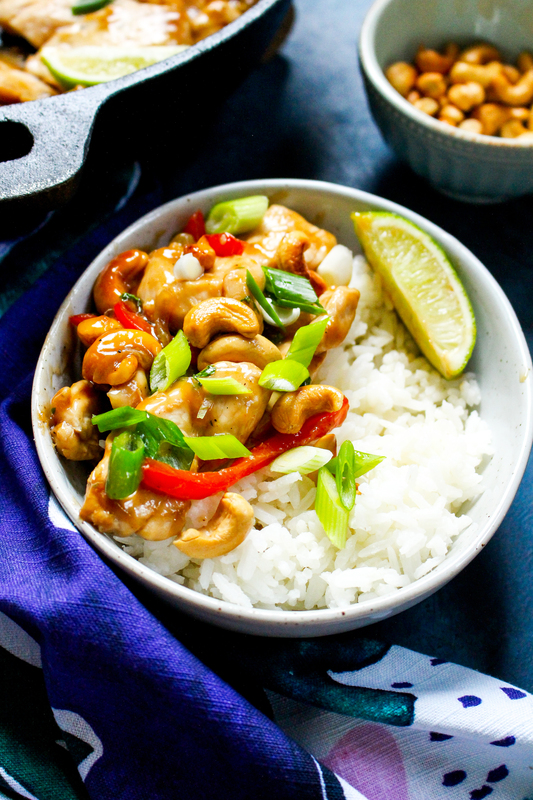 This stir fry comes together in 30 minutes or less (20 if you don’t count chopping time! 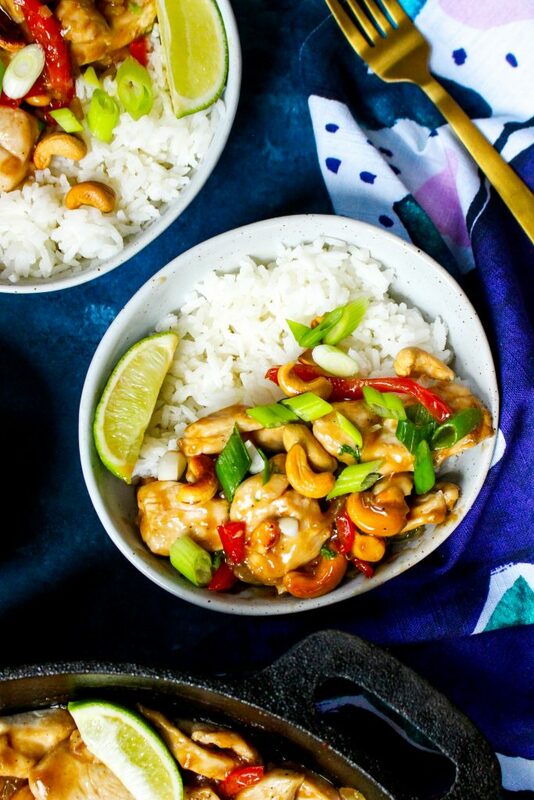 ), and is loaded with the nutty flavor of cashews. My favorite of all the nuts. Forever and ever. Cashews are where it’s at for me. And, in my opinion, they are very underutilized in stir fries! Usually, if a nut is in the mix, it’s going to be peanuts. Not today! Nope. We’re going all in with some cashews. The sauce comes together with minimal ingredients. The nuts get crispy and nutty and golden. The chicken and veggies cook up in a hot skillet until tender and flavorful. I throw in a couple Thai chiles for some heat. That sauce goes into the pan and magic happens. Suddenly, everything is coated in a mouthwatering glossiness of flavor. A few garnishes go a long way here. 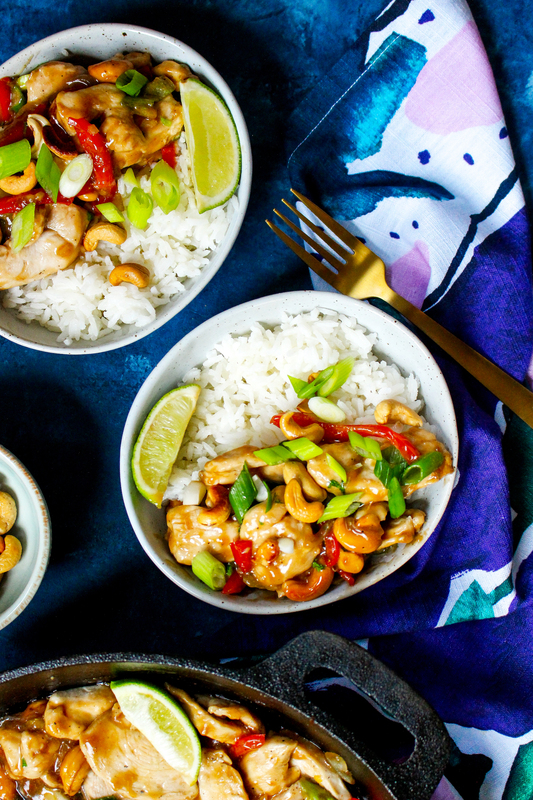 I opt for scallions, fresh cilantro, and the toasty cashews, but you could throw in red pepper flakes, hot sauce, or whatever else your heart desires. Remember: versatility is key to a stir fry habit. It cooks in minutes and is ready to serve over fluffy rice or perfectly chewy rice noodles in no time. It’s pretty. It’s healthy. It’s DELICIOUS. And I’m a big fan. Whisk all of the sauce ingredients together in a small bowl until the cornstarch is completely dissolved. Set aside. Heat the oil in a wok or large skillet over medium-high heat. At this point, I also put my rice or noodles on to cook. Once the oil is very hot, add the cashews and cook, stirring frequently, until they turn golden brown and smell toasty, about 2 minutes. 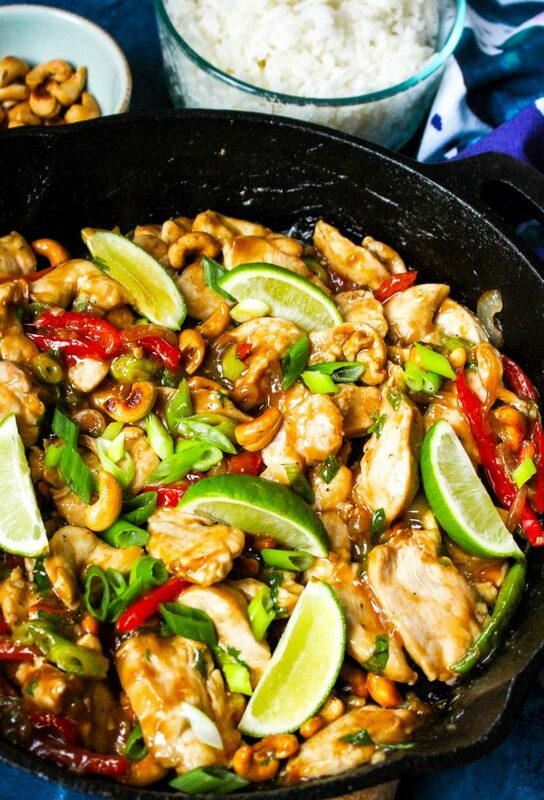 Remove the cashews from the pan and set aside. Add the onion, bell pepper, garlic, and Thai chiles to the pan. Cook, stirring almost constantly, for 2-3 minutes or until the onion is translucent. Add in the chicken, season with salt and pepper, and cook until the chicken turns opaque and is cooked through, about 3-4 minutes. 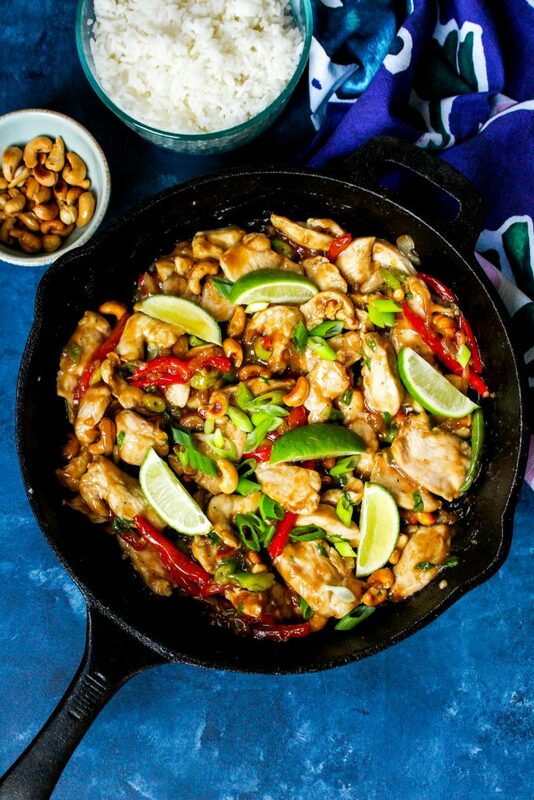 Add the sauce and the cashews to the pan and toss to coat everything. Cook for about 30 seconds or until the sauce is thickened and glossy and everything is nicely coated. Remove the pan from the heat and toss in the scallions and cilantro. Serve immediately with rice or rice noodles and lime wedges on the side. This sounds super delicious yet easy to make. Can’t wait to make this for the kids. Made this tonight for my family and loved it.